Mermaids and merfolk thrive in Second Life (SL), which has a zero-gravity dance environment for those brave enough to put on their tail and leave their legs behind. Landwalkers is the derrogatory term for SL people who haven't yet embraced the inherent beauty and bliss of being free forever from gravity and styles constrained by mere humanoid vanity. Second Life is a place where people express freedom in many ways. Being merfolk is a particularly fun and empowering experience. 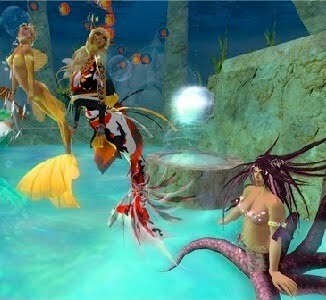 As merfolk, we swim through joy in SL, enjoying complete freedom from gravity in our dances and Animation Overrides (AO). On Land and Undersea! Yeah! My complete transformation to mer came this week. It was the second time in SL when I felt completely jurassic. I was with club owner Liz Harley, we were both mer, but she has such a killer AO that I was completely floored... JURASSIC ME!! EEEEK! I begged her for the SL landmark (LM), which she offered generously. Anyways, today I got a group IM from Marybelle Lavender on Merfolk of SL. Oh, Merfolk party now at Hercules! Hmmm okies great! I'm in the gig! Come round to Hercules for free merman and mermaid outfits!!! I plan to make up a kit for my students will full instructions on how to go mer! Master of ceremonies at the Hercules gig was Xia Ysabel who has a very unusual merfolk avi, with octopus tentacles. Most merfolk avis have gorgeous fish tails. Way cool to discover the next generation of merfolk looks! Wow! Also joining us for the merfolk dance party was Ellender Donner, and Psyche Spore, who is a wonderful dance hostess. Phoenix Ishmene arrived a little after the start and stayed later too. I've been interested in SL merfolk culture since my early appearances in The Light Dancer's shows with Cellandra Zon. The first act of our first show was done in mermaid outfits, and I shall always cherish the beauty of those scenes (use them in my profile to this day). Musicians are a major factor driving the adoption of merfolk looks and culture. In particular Louis Landon's new CD is Solo Piano for Love, Peace & Mermaids. Well, I hope you can find a minute to stop by Sea of Hercules, pick up your free merfolk outfit and give it a whirl. Try the merfolk dance ball there... Way fun! Being merfolk is a particularly joyous celebration of life that is truly at the core of SL fun.